I really like Rodial and although I may not always agree with their shock tactics when it comes to naming products, I do rate the range of results driven skincare and bodycare. I've recently been trialling Rodial Glam Balm Wipes. Regular readers will know that I don't agree with cleansing wipes but I do appreciate that they serve a purpose and I realise that many people can't live without them, particularly during party season. As with all Rodial products, the packaging is seriously sleek and uber desirable. Personally, I'd prefer a "click" function to ensure the freshness of the wipes, particularly given that I only use wipes occasionally and find that they can dry out quickly with just a sticker seal . 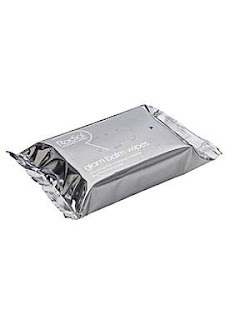 The wipes weren't particularly moist so I found that I needed to use at least 2 to effectively cleanse when wearing full makeup and at £15 a pack, that's some pricey usage. I liked the scent which stays true to the Glam Balm range. The wipes were thick and didn't rip as I moved them over my skin, as some cheaper brands can. They felt gentle and I didn't feel that that I was overloading my skin with nasties, nor stripping it of its natural oils. Having said this, I just didn't feel that the cleansing was as effective as with other wipes I've tried. At £15 for a pack of 25 wipes, they're not cheap (60p each!). In my opinion, you'd be better off checking out Good Things Total Wipeout Face Wipes and saving your money for one of Rodial's amazing moisturisers.